A woman in a man's world, the formidable Elizabeth I (r.1558-1603), daughter of Henry VIII and his second wife Anne Boleyn, was enormously shrewd and effective in wielding power. Yet the picture we have of Elizabethan England is one of a flourishing artistry and lots of "ye olde feastes." "Gloriana", as Edmund Spenser called her in his Faerie Queen (1590), presided over an enormously successful and prosperous period in English history. Catholic Philip II of Spain (husband of Elizabeth's half-sister and predecessor "Bloody" Mary I) sent his fleet to unseat his Protestant sister-in-law. Elizabeth's defeat of the Spanish Armada in 1588 established England as a great naval power, a prowess that was legendary until after World War I ("Rule Britannia, Britannia Rule the Waves"). Another plot to place her Catholic cousin, Mary Queen of Scots, on the throne was also firmly ended with the execution of the Scottish Queen. Elizabeth I never married but used her eligibility as a powerful diplomatic tool. Apparently she was in love with Robert Dudley, Earl of Leicester and his stepson Robert Devereux, Earl of Essex (whom she had beheaded for treason). William Cecil, Lord Burghley (who built the magnificent Burghley House) was her first minister and an amazingly good administrator. 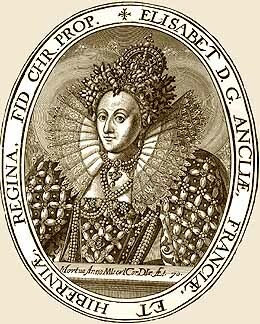 Sir Francis Drake circumnavigated the globe and claimed the California coast in her name and Sir Walter Raleigh (of pipe tobacco fame) took possession of lands in America in her name -- "Virginia" is named after the supposedly virgin Queen. She used charm and flattery to control her "faithful commons" and won the hearts and affections of her subjects. Elizabeth I -- Corel image. 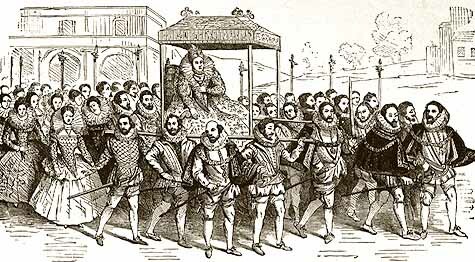 Elizabeth in Her Palanquin -- Ridpath image. Elaborate Elizabethan houses were designed and built, many of them by the architect Robert Smythson (1536-1614) who was responsible for Hardwick Hall, Longleat House and Wollaton Hall. The miniaturist and goldsmith Nicholas Hilliard (c.1549-1619) was the most famous artist in her court. But is was in literature and music that the great names bubble over. What an age! What a court! WHAT A WOMAN! No period in English literary or musical history compares with this in terms of sheer skill, productivity and genius. Though the Renaissance may have come late to England, it ended with an awesome roar of creativity. Like so many of her predecessors, Elizabeth is buried in Westminster Abbey. 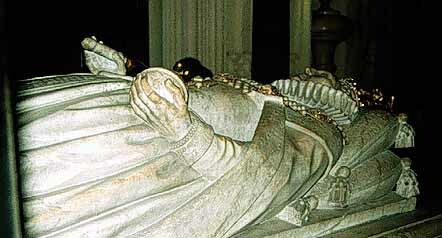 ART: Elizabeth's Tomb -- Photo from Westminster Abbey, c.1990. Elizabeth I (Luminarium by Anniina Jokinen) -- Contains links to various biographies, images, articles, works and other sites and resources; the Luminarium is a web treaure. Elizabeth I (britannia) -- Images and profile. Elizabeth I: Selected Writing and Speeches (Modern History Sourcebook) -- Online text. 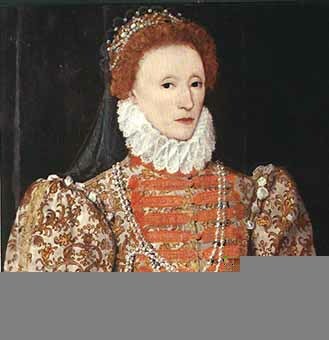 Selected Poetry of Elizabeth I (University of Toronto) -- Online text. William Harrison: Description of Elizabethan England (Modern History Sourcebook) -- A detailed account from a contemporary observer. Elizabeth I (Berger) -- Portrait by Hans Eworth (with extended commentary). Queen Elizabeth (CGFA) -- Drawing by Nicholas Hilliard (mirror at UNC).